Super Meat Boy has quite the posse. Tim, from XBLA's Braid, was the first to fly their meat freak flag. Bit.Trip Beat's Commander Video then donned the colors, and now a fellow Newgrounds compatriot has joined the ever-growing army of meat fans: Alien Hominid. Score one for, well, everyone! SMB is expected to feature between 12-14 characters from other indie games, so we've still got a bunch of surprises left in store. Super Meat Boy is leaping for a Q4 release. In the meantime, go play Meat Boy or Alien Hominid. Wow, could this Super Meat Boy game get any better? I can't wait to play this game. This one is quickly moving up my "most wanted" list! I thought it was already at the top! Definitely my most wanted WiiWare game, I haven't been this excited since Mega Man 9! Sweet! Can't wait to see who's next. This game is getting more and more interesting everytime I hear about it. Personally I'm still hoping for The Kid to appear, I'd just like to have a game with him that I can beat (seriously, I'm not even able to get by Mike Tyson). Wow, that's incredible. I can't wait! It'd be cool to see one of the Castle Crashers in there too. Wait, I haven't been keeping up on this. Is this a platformer with a ton of other indie characters in it? This is ridiculous...ly awesome. Q4 sounds like a delay to me...but it'll probably be worth the wait! It's been on my WiiWare most-wanted list, but it's moving up my overall most-wanted list now. @Bahamut ZERO: Yeah, somthing like that. YES! 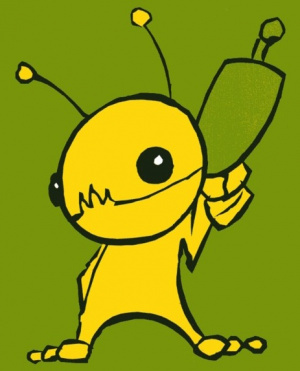 I loved Alien Hominid HD on XBLA as well as Castle Crashers. I didnt like the flash Alien hominid because of the controls, but after AH HD, Im glad he will be in SMB. I'm loling so hard right now. I'm not surprised. In the flash game, one of the castle crasher warriors was an unlockable costume used after collecting enough bandages. When Commander Video was announced many people screamed "Alien Hominid next please!" I guess dreams do come true. I jumped to conclusions and thought that Alien Hominid was coming to WiiWare. Then I read the article. Any chance of a WiiWare Alien Hominid, viral marketing guys? Yeah, I'd second a call for WiiWare Alien Hominid! Awesome. No way I'm skipping this title now. I'm very curious. I'd honor a new Alien Hominid if they added a health bar of some sort. No health bar! Contra and Metal Slug don't have them, I see no need. But it makes the games unnecessarily frustrating. It would be nice to at least add 3 hits to Hominid. It was annoying having to respawn every 5 secs on the intense parts. Somehow I'm smelling WiiWare's next "perfect 10."